Buy clothes in a “regular” store. My first time ice skating in over 20 years! Loved every minute of it! Fortunately I stared working on my list before I hit my weight loss goal as I found doing these things made me happier. And this in turn made me healthier! Two and half years later, there was only one thing left on my first list: ice skating. Over the Thanksgiving holiday I finally crossed it off my list. So, why ice skating, you ask? I used to ice skate as a child. I even took lessons for a bit. I don’t recall why I stopped, but my guess is I ran out of babysitting money and confidence. Most likely it was confidence. I was always overweight and unsure of my body, so I imagine I gave up once the lessons became more difficult. The last time I went skating was in college. My obesity kept me from many activities as an adult and no matter how fun it looked, I wouldn’t go ice skating. Every November when the outdoor ice rinks go up, I would look at them with sadness. The thought of my fat self falling and not being able to get back up was too much to bear. When you’re obese, being humiliated in public is a huge fear. At least it was for me. I’ve been at a “normal” weight for a while, but I was still scared to try to skate. This is what finally made me decide to cross ice skating off my list. My two children have asked for years to go skating. Really, I had no excuses to give them. When I run a race, my mantra is “all you have to do is finish”, so I revised it to “all you have to do is try” for ice skating. It was the first time my kids were ice skating, so I wanted it to be a positive experience for them. I told them that they would fall, it would be cold, but all they had to do was get back up and keep trying. I repeated this in my head until I took my first step on the ice. Jack, Jill and I clutched the wall on our first turn around the outdoor ice rink. It was scary trying to glide forward on those thin blades, but it came back to me. Call it muscle memory or just plain old memory, but I started to skate. I held on to the wall for another two or three times around the rink, but I finally decided to let go. “If I fall, I fall,” I reassured myself. I wasn’t the scared, unsure obese girl, but a healthy, confident woman who could survive the humiliation of falling. 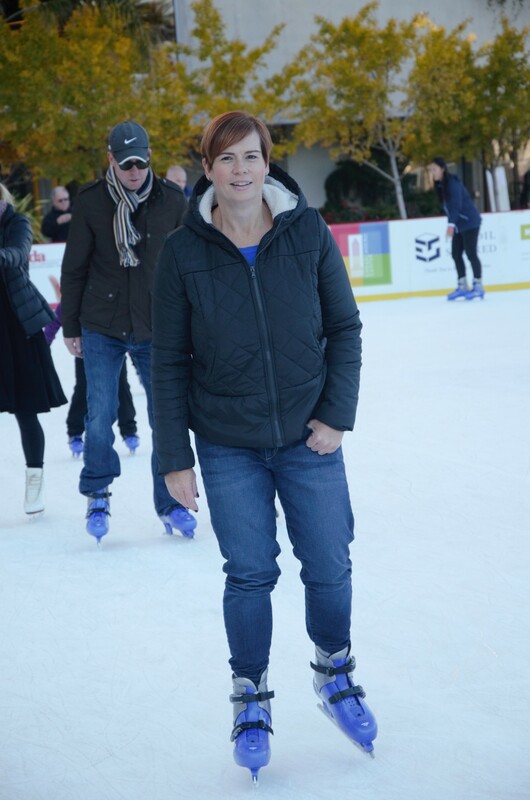 And really, it wouldn’t be humiliating…I would be like any other person trying to skate! Well, I didn’t fall once I’m proud to say. I was prepared for it, but I skated forward and backwards even! I was wobbly at times, but I didn’t care. It was wonderful to glide on the ice and just have fun. It was one of those genuinely happy moments. What made it even better was that I was experiencing this with my kids. We skated together and we skated apart. Watching my children try something new reminded me of when they were babies learning new skills. Here I was helping them find their footing, but more importantly, their confidence, on the ice. I am forever thankful that I can share these experiences with my babies. I thought we would only stay for 30 minutes, but we stayed for the whole 90 minute session. When both kids asked if we could go again, I knew it was a successful day! My first step on the ice made the day successful for me, though. Each time I skated around the rink, I realized this day was more than crossing an item off my to do list. This day was a reminder of how much I have changed since I started my “Down the Scale” journey. I am more confident, happier and braver. And when I fail, I know it’s OK because I’m not perfect. Life isn’t perfect. The only thing that is perfect is living life to its fullest. I’ve learned not to let anything, anyone (especially myself) keep me from trying to do my best. So from eating better to trying new activities, I am enjoying my healthy life. And that will be on the top of my to do list, each and every day. This entry was posted in Bariatric Surgery, Gastric Sleeve Surgery, Life After Gastric Sleeve Surgery, Lifestyle Changes, Maintaining Weight Loss, Obese and tagged Children, Confidence, doubt, emotional changes, encouragement, Exercise, Family, Food Lifestyle, Gastric Sleeve, Goals, Health, Ice Skating, Journey, Lifestyle Changes, Maintaining Weight Loss, Mom, Motivation, Normal, physical changes, Surgery, To Do List, Weight Loss, Weight Loss Journey. Bookmark the permalink.